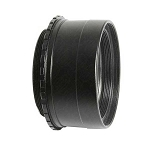 Astrophotography is easily achieved with your telescope by purchasing this T-mount adapter, along with the SLR camera adapter which works with your telescope. You'll need to take precautions to minimize vibrations, such as locking up the mirror if possible as well as using a cable release or remote control to fire the shutter. First, remove the eyepiece. Next, attach the SLR camera adapter where the eyepiece would normally be attached to the telescope, and screw in this t-mount adapter to the opposite end of the SLR camera adapter. 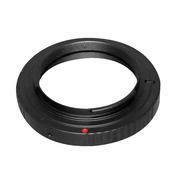 Now you can attach your camera to the t-mount and you are ready to begin taking pictures! Note! Your camera will need to be in fully manual exposure mode, although some brands of camera may also work in aperture-priority autoexposure mode. Additionally, if there is a switch on the camera which chooses the focus mode, that switch must indicate manual focusing.